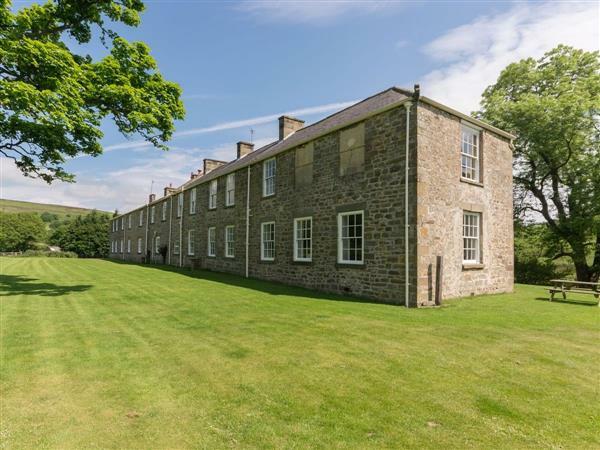 Baysdale Abbey in Kildale, near Stokesley sleeps 17 people. Tucked away in their own picturesque valley, this imposing stone farmhouse (Baysdale Abbey Ref 27943) and three Grade II listed properties (Kildale Barn Ref 27945 [Kildale Barn], Ingleby Barn Ref 27946 [Ingleby Barn] and Westerdale Barn Ref 27944 [Westerdale Barn]) lie on the site of a 12th-century Cistercian abbey in an idyllic setting, where endless footpaths radiate from the door. Accessed by a 2-mile drive, they are set on a working farm where sheep and cattle graze (farm machinery – children must be supervised) within the glorious North Yorkshire Moors National Park. Baysdale Abbey (Ref 27943) has been furnished and equipped to a very good standard. All rooms are spacious, light and airy with wonderful views of the surrounding countryside. Original wooden floors on the ground level blend with shuttered windows, cornices add decorative touches and open fires in the reception rooms provide a welcoming atmosphere. A large natural garden surrounds the house and is edged by a fenced beck, providing a good habitat for an array of wildlife. Dating back to the 1800s, the other three holiday properties (Kildale Barn Ref 27945 [Kildale Barn], Ingleby Barn Ref 27946 [Ingleby Barn] and Westerdale Barn Ref 27944 [Westerdale Barn]) offer character accommodation in a tranquil and idyllic location. Vaulted beamed ceilings and wood-burning stoves add to the charm and character providing a welcoming atmosphere. Offering 3 miles of sandy beaches is the historic port of Whitby with its picturesque harbour and cobbled streets. Here you can board the North Yorkshire Moors Steam Train (Hogwarts Express in the Harry Potter films) and take a memorable journey through the stunning Esk Valley. Castle Howard, Nunnington Hall, Duncombe Park and Rievaulx Abbey are just a few of the treasures awaiting discovery. The coastal villages of Staithes, Runswick Bay and Sandsend all lie within 23 miles. This is an ideal holiday location at any time of the year. Shop and pub 3 miles. All properties: Electric, bed linen and towels included. Electric cooker. Shared 2-acre moorland grounds. Parking (2 cars). Shared games room with pool table and kitchen facilities. Natural water supply from borehole. Welcome pack. No smoking. Holidays run from Friday to Friday. NB: Fenced river in grounds. Ground floor: Living room with wooden floor. Dining room. Kitchen with breakfast area. Separate toilet. First floor: 8 bedrooms: 3 double (one 6ft, one 5ft), 3 twin, 1 bunk, 1 single (4ft). Bathroom with bath, shower cubicle and toilet. Bathroom with corner bath, shower cubicle and toilet. Two bathrooms with shower attachment and toilet. Open fires in living and dining room included. Oil central heating included. Travel cot. High-chair. DVDs. Microwave. Washing machine. Tumble dryer. Dish washer. Freezer. Wi-Fi. Payphone. Large lawned garden with sitting-out area and furniture. Barbeque. Cycle store on request. For a better idea of where Baysdale Abbey is, you can see Baysdale Abbey on the map below. Baysdale Abbey is in North Yorkshire; should you be on the lookout for a special offer, you can find all the special offers in North Yorkshire. It's always worth checking to see what is on offer at the moment. Do you want to holiday near Baysdale Abbey (27943), you can see other cottages within 25 miles of Baysdale Abbey; have a look to find your perfect holiday location.